To Cite: Noorshafiee S, Maddah G, Naghavi Riyabi F, Abdollahi M, Abdollahi A. 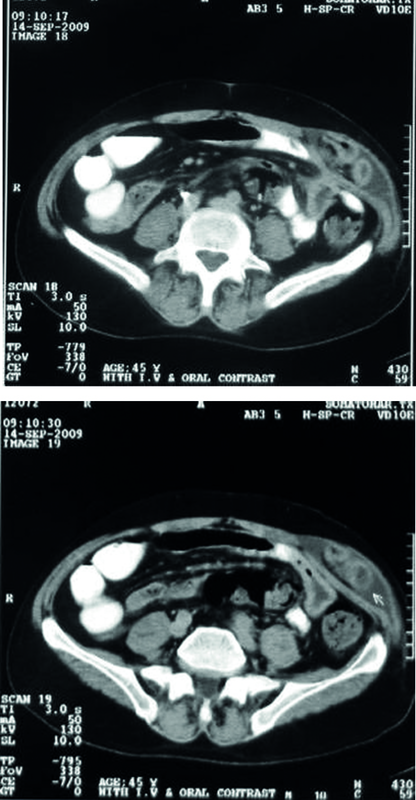 Port Site Interparietal Hernia After Laparoscopic Splenectomy: A Case Report, J Minim Invasive Surg Sci. 2014 ; 3(1):e7748. Laparoscopic trocar site interparietal hernia is a rare type of incisional hernia, which has been rarely reported. This type of hernia is usually observed when the fascia or peritoneum is not repaired or not completely closed. This complication may lead to some serious problems. We aimed to report a case of port site interparietal hernia after laparoscopic splenectomy. In laparoscopic splenectomy, it is often necessary to enlarge the port site to 10 mm to facilitate the removal of the spleen. Accordingly, laparoscopic trocar interparietal hernia may be seen in spite of its prevalence that has been reported to be 1%. From the view of anatomy, interparietal hernia is classified as a type of hernia in which the viscera is entrapped between muscular layer and abdominal fascia. We elucidated a case of trocar site interparietal hernia after laparoscopic splenectomy. A 54 year-old man was treated with corticosteroid because of the idiopathic thrombocytopenic purpura (ITP). Since the patient didn’t respond to medical therapy, he was candidate for laparoscopic splenectomy. Preoperative ultrasound scanning revealed splenomegaly (8×14CM). Putting the patient in "French" position, the first 10 mm trocar was inserted at the umbilicus using Hason's method and a pneumoperitoneum was created. The second 10 mm trocar was inserted in the midclavicular line on the left side of the abdomen (Palmer's point). Then, the third 5 mm trocar was placed at the epigastric area. Splenectomy was performed and the liberated spleen was placed in an endobag. It was decided that the spleen be retrieved from the trocar site (10 mm) in the left side. Because the spleen was too large to be extracted through a 10 mm trocar site, we enlarged the incision (about 15 mm). Having been crushed by the forceps, the spleen was retrieved and then the external fascia was sutured with 2/0 nylon string. The laboratory tests after surgery showed normal platelet count. Two weeks later, the patient was again referred to the emergency department in a poor general condition, complaining of fever and vague abdominal pain. The patient was hospitalized with the diagnosis of overwhelming post splenectomy infection (OPSI) and was treated with suitable antibiotics (imipenem 1gr q6h). The response to medical treatment was observed. After resolution of the symptoms, the patient was discharged from the hospital in good condition with instructions to continue taking oral antibiotics (amoxicillin at 1.5 g per day and ofloxacin at 400 mg per day) for two weeks. Again, one month after the operation, the patient with abdominal pain, nausea, vomiting, and obstipation was referred. the patient declared that the pain was generalized, which have been initiated from the left port site and the maximum pain was in the left side of the abdomen. Vital signs were normal. In abdominal examination, clear distension was not observed. Laparoscopic port site scars were evident. The bowel sounds has been increased. Abdominal examination revealed a mild tenderness in LLQ with no signs of peritoneal irritation. Biochemical blood tests were normal. The complete blood count (CBC) with differential revealed a mild leukocytosis with a predominance of polymorphonuclear leukocytes (PMNs). Platelet count was also normal. Abdominal X-ray also showed a small bowel loop in LLQ. Abdominal ultrasonography was performed as there was a high index of suspicion for incisional hernia. The radiologist reported a loop of bowel in left port site. Abdominal computed tomography (CT) scan was performed, which revealed dilated small bowel, which was entrapped between the oblique muscles and abdominal fascia (Figure 1). Considering these conditions, which suggested bowel obstruction, the patient was candidate for emergency surgery. Under general anesthesia, the abdomen was opened via LLQ incision at the same site of laparoscopic port. Opening was continued up to the fascia surface. The intraoperative findings demonstrated an intact fascia with no signs of hernia. Also, the fascia was opened. A dilated incarcerated small bowel was detected between the oblique muscles under the fascia, but peristalsis, color and, mesenteric pulsations were normal. A hernia sac was not observed. The bowel was carefully returned to the abdominal cavity and the peritoneum was closed using 2/0 vicryl string (Supabon, Iran). The muscles were also sutured together with 2/0 vicryl string. The fascia was sutured with 2/0 nylon string and the skin was closed with Nylon 2-0. After the operation, the patient’s symptoms were resolved and he was discharged in good general conditions with diet tolerance. The overall incidence of trocar site hernia after laparoscopic surgery is between 0.5 to 2%. In a qualitative systematic review, Helgstrand et al. reported that the overall incidence of trocar site hernia after surgery was between 0.5 to 2%. Trocar site hernia often occurs in trocar site of at least 10 mm and mostly in the umbilical site (82%). Trocar site hernia also is seen in children who underwent laparoscopic procedures. Current data suggest that the size of all trocar incision is 10 mm or larger in adults and all port sites in children should be closed (1). This situation may be occurred in patients with laparoscopic ventral hernia repair. Review of the literatures showed a 22% incidence of trocar site hernia in these patients. Using the prosthesis larger than 10×15 centimeter, female and diabetic patients showed a higher incidence for Trocar site hernia. These patients also underwent dilatation of trocar site for insertion of the prosthesis, which may act as another risk factor for occurrence of this complication (2). Actually, our patient experienced such a situation. Interparietal hernia is a rare type of hernia, which is not usually diagnosed before surgery because of unusual symptoms and normal physical examination. In most cases, it is diagnosed during surgery or autopsy. The size of hernia sac, hernia contents, existence of strangulation are the factors that affect the type and intensity of patient’s symptoms, though most of the patients complain of abdominal pain (3). According to the literature, three cases of interparietal hernia after the open retromascular repair of ventral hernia have been reported (4). One case was reported of incisional interparietal hernia on the site of open appendectomy incision (5). But these studies dealt with the open technique which required expansion of the incision and more dissection. Elashry et al. reported five cases of incisional hernia followed by laparoscopic nephrectomy. All of these patients had a large kidney due to malignancy or polycystic kidney disease, in which the surgeon had to expand the incision. Some authors have recommended fascial closure of ports greater than 5 mm (6-8). In our patient, to retrieve the large spleen, the 10 mm port site incision in left side was opened. There are some risk factors for developing any incisional hernia after laparoscopic surgery. They included trocar diameter, preexisting fascial defects, operation and patient-related factors. Additionally, the use of drain and site of insertion are important (7). Other risk factors for incisional hernia are obesity, diabetes mellitus and infection. Other minor factors included the location of port especially in the midline under the umbilicus and stretching the port site for retrieval (8). In our patient, the risk factors included enlarged 10 mm trocar site and use of corticosteroids. A new technique for prevention of trocar site hernia in patient with laparoscopic ventral hernia repair is mesh introduction through the port, which is situated at the center of the ventral hernia. Depending on the size of the prosthesis, the mesh insertion port may be a single10 mm to15 mm port (9). In laparoscopic surgeries that are followed by resection of large organs such as the spleen or kidney, sometimes it is needed to expand the port site for retrieval of the resected organ. Therefore, interparietal hernia may occur in the port site. It is suggested to close the port site (especially, ports >10 mm) in layers or mass closure carefully. If the length of incision is so long, in order to decrease the rate of this type of hernia, the layers should be sutured anatomically and external fascia closure is not enough. Also, mass closure would be the correct approach for midline laparotomy incisions. We gratefully acknowledge Ms. Hassanpour for editing the manuscript. Implication for health policy/practice/research/medical education: In laparoscopic surgeries that are followed by resection of large organs such as the spleen or kidney, sometimes it is needed to expand the port site for retrieval of the resected organ. Authors’ Contribution: Noorshafiee S, Maddah Gh and Abdollahi A carried out the procedures and directly involved in the drafting, giving critical comments and revising of the manuscript. Naghavi Riyabi F and Abdollahi M collaborated in the gathering the information and were directly involved in the drafting and revising of the manuscript and postoperative care.